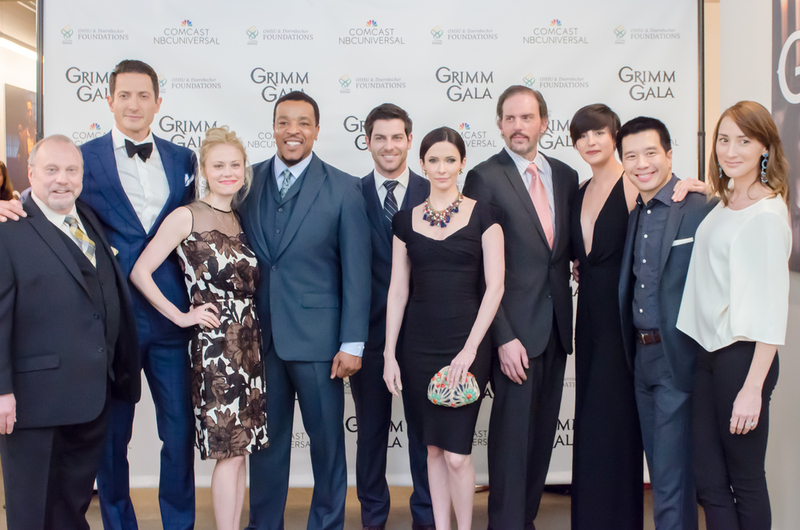 CVLUX — LUX Philanthrophy: NBC Universal's Grimm's Gives Back & 100th Episode! Grimm Cast Via NBC Universal - The cast of Grimm had the second annual Grimm Gala presented by NBC Universal and Comcast on Saturday, February 13 at the Exchange Ballroom. It was a Grimm Family Affair with guest performer Chris Thile, mandolinist musician and husband of Claire Coffee joined by David Giuntoli, Russell Hornsby, Sasha Roiz, Silas Weir Mitchell, Bitsie Tulloch, Reggie Lee, Bree Turner, Coffee, Jacqueline Toboni, and Portland-based actor Danny Bruno on the stage. As Roiz emceed the ‘Grimm Gala’ he told the sold out crowd that he noticed families of the young patients who didn’t live in town were staying in campers in the OHSU parking lot to stay near their children and that’s when he thought of how Grimm can give back to the city that has welcomed them with the Grimmster Endowment. The Grimmster Endowment is an organization that helps to cover costs not ordinarily covered by health insurance, such as travel and lodging expenses for the families of patients at OHSU Doernbecher Children’s Hospital in Portland. The first year of the event they raised $300,000 and this year with the help of fans they raised $386,000 for the endowment. The idea for the endowment came from Roiz and castmates as they began visiting the hospital after they started filming in Portland.